HOW TO BOOK A TOUR ~Click on the buttons below. Click here for our cancellation policy. OUR KAYAKS ~ We use a mix of solo & tandem (two-person) sea kayaks. We mainly use tandems for our shorter trips because they are faster, more stable, very spacious and easier for novice paddlers to use. Let us know if you prefer a solo kayak. Trips depart every evening roughly two hours prior to sunset. Click below for exact timing. 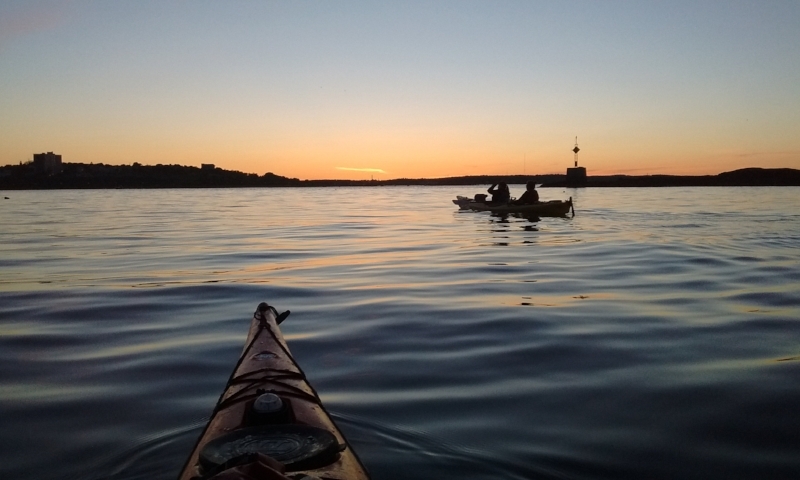 The hours before sunset offer the best time for paddling on the waters of Casco Bay. The sky tends to explode with color and the seas often become glassy and calm. As you glide through Portland harbor you'll look out for wildlife like seals and osprey and enjoy a unique view of lighthouses, forts and the Portland Observatory. The Sunset Tour is designed as a leisurely paddle that ventures just far enough along the waterfront and towards the islands to position the group for a panoramic view of the sun setting over the city while paddling back to the East End Beach. This two-hour tour is designed for paddlers of all experience levels -- including first-time kayakers. Fort Gorges, a Civil War-era granite fort surrounded by water, is one of the most fascinating spots in Casco Bay, and it's only accessible by small boat. 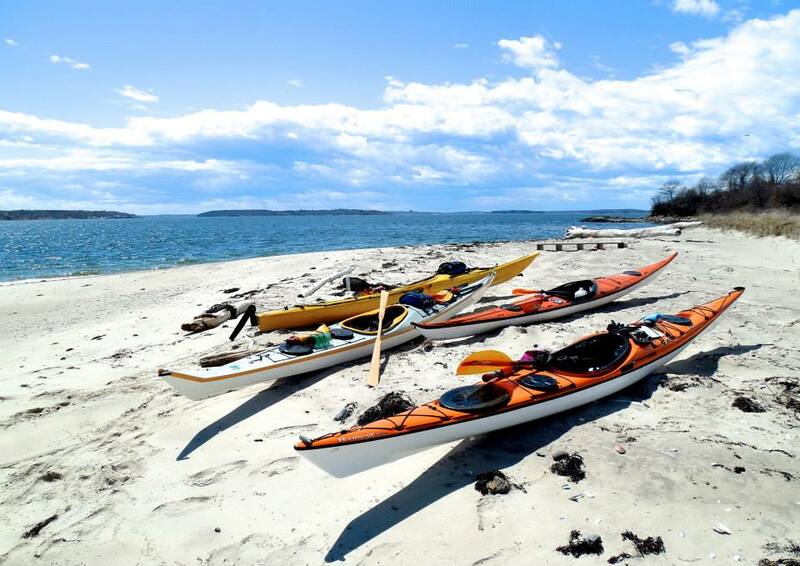 This three-hour trip is the best way to combine the experience of sea kayaking on the Maine coast with exploring one of the region's most interesting historic landmarks. We'll start off with a paddle into Portland harbor and then make the crossing out to Hog Island, where we'll land on a beach and explore the elegant granite halls, mysterious passageways and towering ramparts of Fort Gorges. Make sure you check out the gorgeous view of the Portland skyline from the rooftop! Your knowledgeable guide will tell anyone who's interested about the Fort's storied history, and you'll have time to explore on your own as well. You are welcome to bring a snack or lunch if you'd like to have a brief picnic at the fort. This trip offers an island-hopping adventure in the archipelago of gorgeous islands that lie along the edge of Casco Bay. The many islands create endless options, so your exact route will depend on the weather conditions and tide cycles. On some days we take a one-way route that allow us to venture further into the islands and keep the wind at our backs as much as possible. You'll look out for wildlife like seals, eider ducks, herons and osprey and you'll enjoy views of some of the bay's most fascinating landmarks, including lighthouses and historic forts. Halfway through the trip you'll stop at an island for a break. Your guide will provide a snack (fresh fruit and cookies) and you are welcome to bring a picnic lunch. $40 per adult, $35 per child age 7 - 16. The slower pace of this tour is perfect for families with younger children. We'll take it easy, leaving plenty of time for tidepool exploration, kayak skill-building, and paddling fun. Only children 7 and older can paddle with Portland Paddle - exceptions might be made for mature 6-year-olds on the family tour. All children younger than 12 must paddle in a tandem kayak with an adult. The silence and darkness that envelopes Casco Bay at night can be incredibly peaceful. But there's also plenty to look at: The stars overhead, the sparkling waters below and the flickering lights of the Portland harbor lighthouses. This tour offers a chance to see an entirely different side of Portland harbor. Your guide will start your tour off with a brief paddling lesson and safety talk before leading you past rocky Fish Point and towards Portland harbor. As you begin to paddle towards the islands and view the landmarks of the harbor you'll pause to take in the view of the sun setting behind the city. Then you'll glide through the darkening waters looking out for seals and bioluminescence as you make your way back to the mainland. The group will stick close together, keeping track of each other with the help of flashlights and glowsticks. Our Lighthouse & Fort Tour is a chance to sea kayak to some of the most historically fascinating and scenic landmarks in the Portland region. 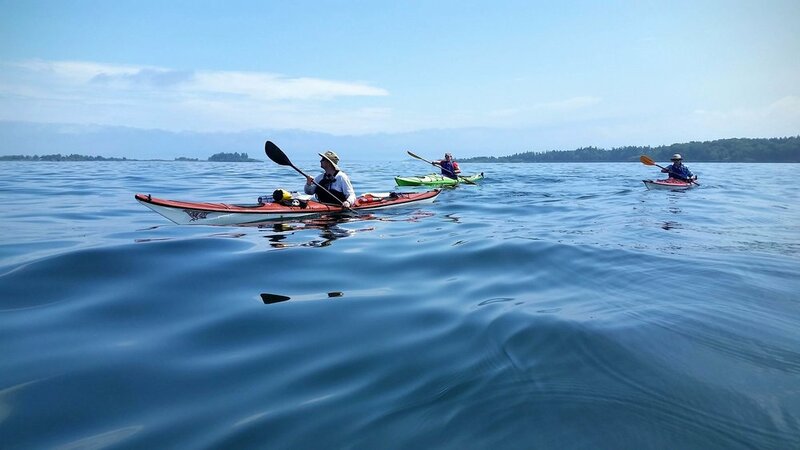 Unlike our other tours, we limit this trip to 6 or fewer people and we require participants to have at least one previous sea kayaking experience. You'll spend the day island-hopping through the rugged islands of Casco Bay. Along the way you'll visit several 19th century forts, paddle past lighthouses and feel the swell of the open ocean underneath your kayak. Among the lighthouses and forts you might visit are Spring Point Light, Fort Preble, Portland Head Light, Fort Scammel, Ram Island Light, Bug Light and Fort Gorges. 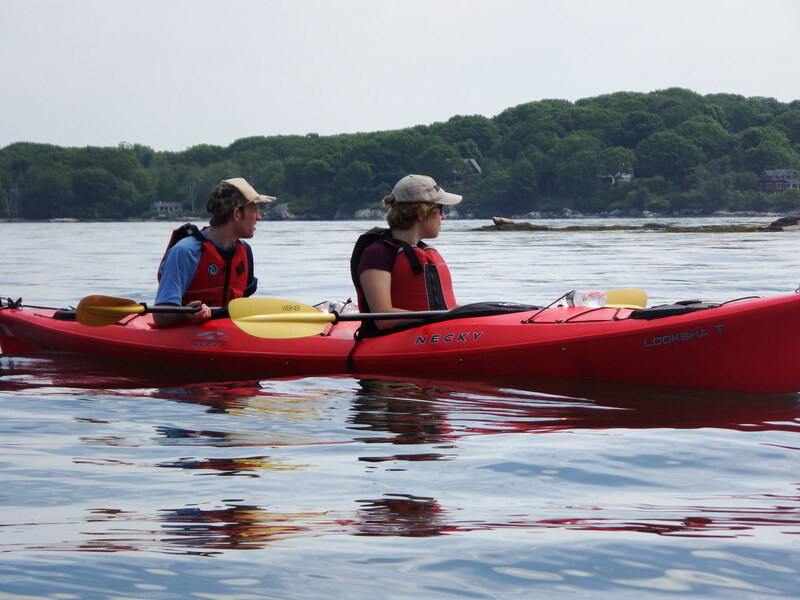 You'll also have the chance to hone your paddling skills, learn about the natural history of the area, visit islands on the Maine Island Trail and spot wildlife like seals, osprey and eiders. You'll see many sides of Casco Bay, including the bustling working waterfront of Portland harbor, the cliff-lined outer islands exposed to the open ocean and the more protected coves lined with beaches. This trip is designed for paddlers of a range of skill levels and the group will take many breaks and stops along the way. However, the trip does involve a very full and active day, so we suggest our shorter trips for first-time kayakers or anyone who has difficulty with prolonged physical activity. All participants should have tried sea kayaking at least once before. This trip typically starts in a different location than our main site (due to a one-way route), so you will be transported by van to the launching site at the start of the trip. The cost of this trip includes a delicious picnic lunch, with a vegetarian option. We are happy to arrange private guided trips if the trips listed above don't fit with your schedule or interests. 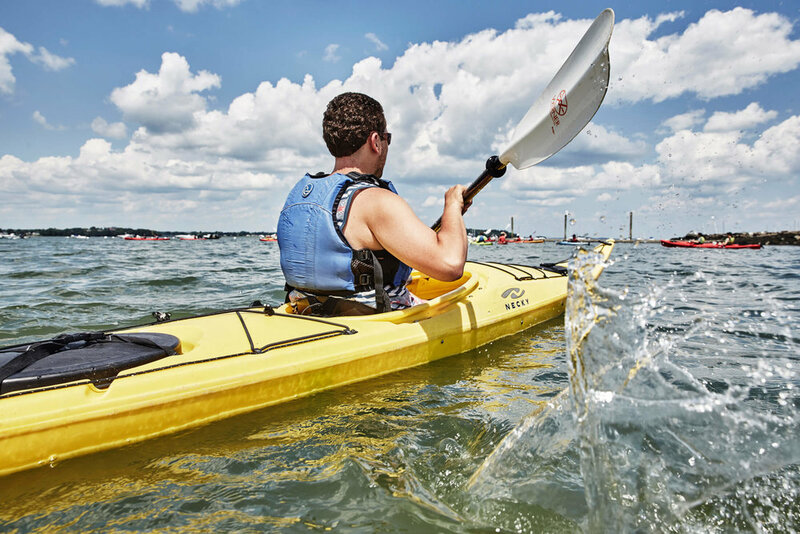 Visit our group events page to learn more about Portland Paddle's customized kayaking experiences for individuals, wedding parties, corporate groups, families, schools, camps and other groups. We can create a paddling adventure that's just right for your group. To receive the discounts listed below ask us when you check in for your tour. If you already paid in full we will refund the amount of the discount. College Students (with ID) receive 10% off guided trips. Residents of the East End ( with proof of address east of Franklin Arterial) receive 10% off any guided trip. Veterans and active military receive 10% off any guided trip. Using your own sea kayak? Get $15 off the usual rate. Kayak must be seaworthy and you should arrive early to unload. Q: Where do the tours start and when should I arrive? All of our tours begin at the East End Beach unless we state otherwise. Please arrive 10 minutes before your tour is scheduled to begin, and give yourself extra time if you need to park. Q: What's the parking situation? There is free all-day parking in the lots roughly 50 yards up the hill on Cutter Street, as well as on most streets in the residential neighborhoods nearby. Generally it's easy to find a parking spot, though on busy summer weekends you may need to search a bit. Most of the spaces right next to our shop are limited to 5 minutes or two hours. You are likely to get ticketed if you park too long in these spots, or if you park in a spot reserved for boat trailers. Footwear that you don’t mind getting wet (watershoes or old sneakers work well, and sandals or Crocs are okay too). Extra layer to keep you warm. It’s often cooler on the water than on land, so it’s smart to have a fleece or light jacket even on sweltering hot days. It’s also best to wear synthetic materials (not cotton) that will keep you warm even when wet. Anything else you’d like to have with you (camera, snack, gloves, etc). We’ll provide a dry bag. Q: Where will we go on our tour? Your guide will choose a route for your trip based on the group and the weather conditions, though we always try to minimize paddling into strong wind and currents. Every tour is slightly different. There are dozens of beautiful islands to explore within a short paddle of our location, and it's also fun to paddle through the working waterfront of Portland Harbor. Q: How fast do you paddle? Will I be able to keep up? Will I get bored moving too slowly? A: Our pace depends on the group, but we generally take our time. We almost always have plenty of time to get where we're going, so there's no need to rush. We'll keep things moving, but we won't leave anyone behind. Q: How many people go on your tours? We prefer fairly small groups, so we usually have between 3 and 9 people. We allow slightly bigger groups for some of our special trips, such as our Acoustic Paddle tour. State law requires that there is one guide for every twelve paddlers. Q: Can I bring my own kayak? Absolutely. Just let us know ahead of time and have your boat ready to go on the beach before the tour starts. You can receive $15 off the cost of the trip or $50 off for multi-day trips. Please keep in mind that your kayak should be a sea worthy boat. We understand that your plans may change and that you may need to cancel your reservation. As long as you give us 48 hours advance notice, we will offer a full refund on any amount that you have paid (with the exception of multi-day trips and private group trips, which must be canceled 14 days in advance for a full refund). If you need to cancel within 48 hours of our reservation we generally cannot offer any refund, though we will try to reschedule your booking for another day. Q: When do you cancel tours for weather? You can receive a full refund if we cancel a trip due to weather. We usually do not cancel tours due to overcast skies or scattered, light showers (the seas are often especially calm and pleasant on overcast days), but we do cancel trips for steady rain, strong winds and thunderstorms. If you have reserved a tour, we will call you if we are canceling the trip due to weather and give you a choice of either rescheduling or receiving a full refund. Q: Do you use tandem (two-person) or solo kayaks on your trips? Will I have a choice? We have both tandem and solo kayaks, but most people on our shorter trips use tandems because they are faster, more comfortable and more spacious. Plus, if you get tired, your partner can pick up the slack! If you prefer a solo kayak let us know as soon as possible and we will reserve one for you. Ultimately, your guide will make the final call on which boat is best for you depending on your skill level, the weather conditions and your body size. If you are joining a tour on your own, you will either be given a solo kayak or paired up with another person in the group. Q: What brand or style of kayaks do you use? We have a diverse mix of sea kayaks made by Necky, Current Designs and Wilderness Systems. All of our kayaks have rudders or skegs. We have kayaks for all skill levels and most body sizes. Most of our boats are rotomolded (plastic) and a few are fiberglass. Let us know if you have a boat preference; it's likely we can assign you the boat you'd like to use. Q: Do I need to tip my guide? No, only if you want to and feel that it's deserved. Tips are never expected, but always very much appreciated. Want to plan an overnight kayaking trip? Is there a certain watery part of Maine that you’d like to explore? Maybe we can help make it happen. We offer trip planning services that set you up with all the local knowledge and resources you’ll need to explore the Maine coast on your own. We’ll help anyone from expert kayakers planning to embark on the Maine Island Trail to groups of kids looking to have some fun in the water. We’re also happy to help you connect with other reputable guides and outfitters in other parts of the state. Give us a call.